All right, let’s check out another game from the legendary 5 dollar bin! It’s games like this that make the bin so worth it for me because this is a hidden gem that I likely would have never played otherwise. It’s certainly not going to be the next Mario Kart of F-Zero, but Excitebots ended up being pretty fun and certainly worth the 5 bucks. There is no plot so you are free to jump into the grand prixes. There are 5 different cups and each one has 4-5 different races in it. This title is a little different than most racing games as getting to 1st place is heavily encouraged, but there are other aspects in place. See, this game is also a bit of a stunt racing game as the amount of stars that you have in the end is what ultimately matters. Coming in first gives you an extra 55 as opposed to the 15 in second so that’s a good reason to get to 1st place, but you also want to do a lot of tricks along the way. No worries, they come rather naturally. You get stars for drifting and bumping into other cars. If you decide to drive into a forest, you get a star for every tree that you dodge. The stars add up quickly there, but it is typically much more dangerous than the normal path so you have to decide if your driving skills are up to par. If you hit something, then you’ll quickly be taken back a little bit, which can eat up your time although it’s not all that bad. You’ll still be okay even if you crash a few times. Just make sure that you get the stars first. Naturally, you also have a nitro boost that you can activate quite often. You just can’t use too much of it at once or you will overheat so make sure to use it gradually and in bursts. All of what I just mentioned was already in Excite Truck so let’s get into the new features for this title. This game placed a lot more emphasis on the Motion Controls than the older game. For starters, you’ll see various poles throughout the race. You will then have to make a motion with your Wii Remote depending on what color the pole is. Typically it will require you to make a sudden push forward or to act as if you are making a circular motion. To be honest, this is an addition that I definitely would have preferred to not have made the cut. Getting the motions can be as tough as you think considering the Wii Remote’s dicey reputation and it doesn’t add anything to the game. I can guarantee that the game would be even better without this gimmick although it certainly doesn’t hurt the game all that much. It was just a little unnecessary. One of the new additions that I did like was the item boxes and tools that would appear. You can get items like some teeth to throw at enemies or a fishing rod to get some fish/stars. The items are typically fun and if you get a wrench, then you can turn into your true robot form. This was a good addition to the game and I’m glad that they added it. I certainly would like to play without any nitro or items as an option as well, but if you’re going to have some gimmicks, then you may as well add them all in right? You can play a lot of the individual minigames in minigame mode in case you really like one. There’s also a Poker Mode, but I decided not to try it out. It didn’t really pique my interest. There are many other ways to search for stars during the race, but I’ll allow you to find those on your own. The actual gameplay is very smooth, which helps to negate the Wii Remote’s handling. The Wii Remote actually works well enough here. I would still prefer almost any other remote, but it’s passable as you have to hold it sideways to play this game, which has always been the best way to use the Wii Remote for a racing game. Each race is only about 2-5 minutes so they’re short, which helps to make them very exciting. Nothing’s worse than playing a really long race only to discover that you’ve lost and have to play it all over again. The graphics are sound and the robots all look good. This is certainly no Mario Galaxy, but it’s still a big step above titles like Casper and Rudolph. The graphics are not bad, nor are they very good. They’re simply caught in the middle, but that’s not a bad thing. The designs still compliment the races rather well, which is all that I could ask of the title. The soundtrack is great, but I would expect no less from such a solid racing title. All of the themes are fast and intense, which lets you really feel like you’re in the race. Racing games have had a superb track record when it comes to the music included in them and this game does not disappoint here. Completing the cups won’t take you very long. There are 24 courses and all of them are short, but you have to consider that you will be getting this game for a bargain price. Also, there is a good amount of replay value. If you get S ranks on all levels, then you can unlock the Super Excite difficulty so that you can play the stages yet again. Moreover, there are many things to buy with your stars. That’s where it gets to be a bit much though. For starters, you have to actually buy the alternate colors for your vehicles. You have to buy the vehicles and then you also buy avatars for your profile and statues of your cars. This gives you a lot to buy, but earning stars isn’t so simple. For example, you will earn around 200-300 per race, but most of the cars are 2500-5000. I ended up with around 5000 stars when I beat the game so I bought one car. Imagine how long it would take to buy the 20+ profiles, 20 statues, colors, and cars. Certainly longer than I’d really be willing to play this game. I actually did bother to do the S ranks for Excite Truck, which shows how much fun these games are, but it’s not the kind of thing that I’d probably do now. Nowadays, Super Smash Bros is probably one of the only games where I’d actually go that far. Don’t get me wrong, the gameplay here is still a lot of fun, but I’ve got a lot of games to play so it’s best that I move on while I can. 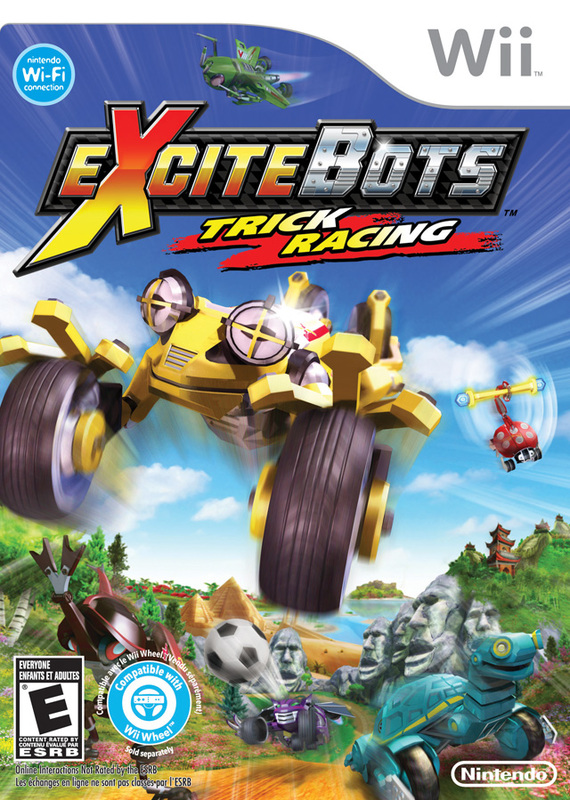 Overall, Excitebots is a fun racing title. It’s certainly a lot better than you would expect upon looking seeing the cover and you should certainly give it a chance. It’s a short, but fun experience and the actual gameplay is quite good. It’s fairly unique for a racing game and you’ll have fun earning those stars as you beat the levels. The soundtrack is really good and the graphics are sound so this game really has no weak points. There’s also a multiplayer mode to boost the replay value a little higher. Yes, this is one of those 5 dollar bargain bin titles that is really tough to top. This entry was posted in 7 Star Games, Game Reviews, Games, Reviews and tagged Excitebots, Game Review, Motion Controls, Nintendo, Nintendo Review, Nintendo Wii, Racing, Racing Game, Review, Robots, Video Game, Video Game Review, Wii Game by dreager1. Bookmark the permalink.